This year Japan celebrates the 150th anniversary of the Meiji Restoration – the event that returned the emperor to the throne, and set the country back on the course of development. Neil McQuillian heads to Kyushu, the southern region where this momentous moment in Japanese history played out in 1868 – and discovers what an immense impact this unsung corner of the country has had on modern Japan. August 1863, southern Japan. A squadron of British warships stalks across Kagoshima Bay towards the eponymous town, capital of the Satsuma domain. The British government has spent the past eight months demanding an apology from the rulers of Satsuma – the Shimadzu clan – for their samurais’ killing of a British merchant who had “disrespected” a Shimadzu nobleman in a roadside incident. But even now, with the British cannon poised, no apology is forthcoming. The British lose patience; firing commences. The bombardment is relentless. To decode these classic images of Japan, you have to go where most tourists don't venture – to Kyushu, far from the modern nation's centre of gravity. When you think of Japan, is it Tokyo you see, beeping and flashing and zooming and whooshing, a swirling vision of high speed, hot neon and hyper reality? Or is it, perhaps, some exquisite display of ancient tradition, painstakingly performed as if the modern world had never happened? To decode these classic images of Japan, you have to go where most tourists don’t venture – to Kyushu, the southernmost of Japan’s main islands, far from the modern nation’s centre of gravity. For Kyushu bred the isolationism that preserved the nation’s traditions in aspic. And it also provided the arena for events that dragged Japan out of that inertia – and into a process of frantic modernisation. In other words – that Kagoshima bombardment flicked on Tokyo’s switches. It all began in Nagasaki, one of Kyushu’s main cities, with the late sixteenth-century arrival of Portuguese merchants. Initially welcomed – particularly for their valuable guns – the local powers-that-be soon got twitchy about Christianity’s spread. Persecutions ensued (as depicted in the 2016 Scorsese film Silence) and then – slam – Japan closed its doors to all comings or goings for the next two hundred and twenty years. On pain of death. Well, it nearly closed them. On a rainy, blustery weekday morning, I meet Yuki Taniguchi in the centre of town. Yuki is a Nagasaki local – as a pupil at the famous Shiroyama Elementary, she would find pieces of glass, warped grotesquely by the 1945 nuclear blast, during playtimes in the schoolyard. Now, her umbrella crumpling around her in the wind like an angry magpie’s tail feathers, Yuki points to a patch of glistening tarmac – “All that used to be water,” she tells me. 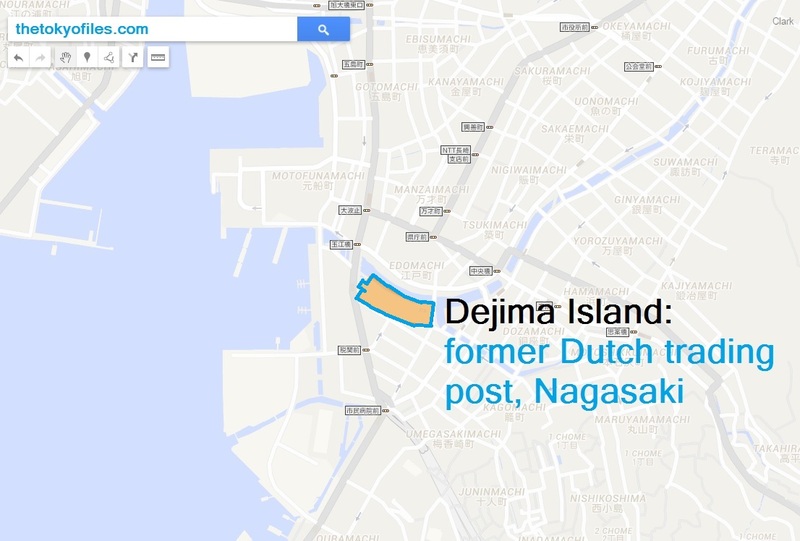 For where we’re standing – at the side of a dual carriageway just inland from the bay – was once part of an artificial island, a football-pitch-sized enclave called Dejima that was Japan’s only connection with the outside world during the isolationist period. From here, a community of Dutch traders – who promised not to spread Christianity – were permitted to operate. Although the district has been re-created to entertaining effect, Dejima might not impress enormously were you to take it exclusively on its own merits. As a chapter in Nagasaki’s startling storybook, on the other hand, the site enchants. For while Kyushu has fairytale natural wonders and world-beating ramen, my main takeaway was something quite different – the region’s history, as the richest array of stories I’ve ever encountered. Stories so vivid, the language barrier simply dissolved. As cities go, Nagasaki is a kaleidoscope. If you start listening to its stories, the place will talk your ear off. Everywhere you turn in Nagasaki, for instance, there’s an arresting context: a Catholic church where “hidden” Christians announced themselves after centuries of persecution; a turtle-shaped Zen temple; Japan’s oldest Western-style house, complete with Madame Butterfly connotations. Then, of course, there are the heartbreaking memorials to the events of 1945. Even the local food has a tale to tell about Nagasaki’s cosmopolitan past – check out the town’s predilection for Portuguese castella cake and so-called “Turkish rice”. As cities go, Nagasaki is a kaleidoscope. If you start listening to its stories, the place will talk your ear off. What ended Japan’s isolationism was a growing awareness that the policy had endangered the nation. While Western countries modernized into military powerhouses, Japan was ignoring technological advances. Kyushu bigwigs fearing colonisation (maritime routes meant that the region would have been first in line) pushed for change. In 1858, Nagasaki and a number of other ports opened up for full-steam-ahead trade, both in goods and, crucially, ideas – particularly those of the technological variety. The really decisive, no-going-back point in Japan’s modernisation, though, took place ten years later. In 1868, the Tokugawa shogunate (a military dictatorship of sorts) that had held sway over Japan since 1600, enforcing the isolation, was finally ousted and emperor rule restored. This juncture is known as the Meiji (“enlightened”) Restoration and Kyushu was its arena. As with so many of Kyushu’s stories, it speaks not just of this site or even just of this town – it is the story of modern Japan as a whole. Stories upon stories upon stories. Another you must not miss in Kyushu is that of Hashima (aka Gunkanjima, or Battleship Island), a small island that was once home to a settlement of coal miners. Come 1959 it was the most densely populated place on the planet; today, uninhabited, it is one of the strangest, the glassless windows of its ghoulishly decrepit concrete structures (Japan’s first) howling out across the water. Finally, back to Kagoshima, which saw that 1863 bombardment. Some of the earliest Japanese experiments with industrial techniques took place here. Most of the old noble samurai families faded following the Meiji Restoration, but the Shimadzu family is still going strong in Kagoshima – Sengan-en, their 1658 residence set in a beautiful garden, is the city’s main visitor attraction. Here, remnants of Japan’s first Western-style factory sit like a wabi-sabi blemish on the town’s beauty spot – yet the story this juxtaposition tells makes the whole place sparkle. And as with so many of Kyushu’s stories, it speaks not just of this site or even just of this town – it is the story of modern Japan as a whole. Header image: kan_khampanya/Shutterstock. Image credits top to bottom (left–right): Yudai/Shutterstock; Sean Pavone/Shutterstock; 809xia/Shutterstock; Sara Winter/Shutterstock; wada/Shutterstock; Alon Adika/Shutterstock.